Somebody at Planet Bluegrass must have been thinking ahead. Punch Brothers and Mumford & Sons back to back on Father’s Day? It was definitely a family affair, but by the sounds of it, young sons and (especially) daughters were the kinsfolk enjoying a special gift on the final day of the 38th annual Telluride Bluegrass Festival. From left, Ben Lovett, Marcus Mumford, Country Winston and Ted Dwane. The four London lads were protected by the huge Shellman stage in Town Park, but the early evening crowd weathered a heavy rainstorm that never let up until near the end of the band’s 75-minute set. By that time, snow could be seen on the peaks of some of the surrounding mountains. It obviously didn’t dampen the spirits of a crowd full of fans not old enough to care about the Sixties’ British Invasion, as the screams brought back memories of another Fab Four to their dads and granddads. 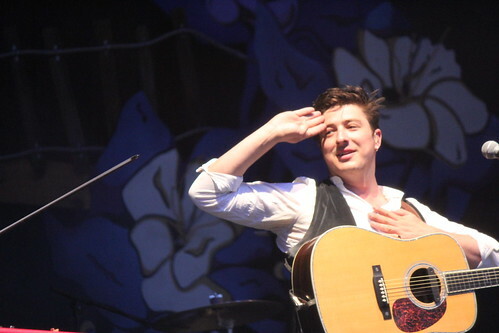 As soon as hunky frontman Marcus Mumford (left) finished the opening number, the title cut to their platinum-selling debut album Sigh No More, the hero worship began. “I love you, Marcus!” was shrieked repeatedly in the direction of the nattily dressed subject of many a schoolgirl crush. For a newcomer to this festival who also was seeing Mumford & Sons for this first time, this grand performance will be the most memorable of TBF ’11. And that’s saying a lot, considering the impressive four-day lineup that included startling acts making their Telluride debuts such as The Head and the Heart and Trampled by Turtles appearing on the same stage as music legends Sam Bush, Emmylou Harris and Bela Fleck. The nasty conditions gave anyone in the audience who braved the elements a chance to forever brag about their “I-was-there” moment. But Mumford & Sons had so much to do with adding fuel to that unforgettable fire. Could this rival U2 at Red Rocks as a history-making rock show? Even if it’s at a bluegrass festival? Mumford had the crowd in the palms of the capable hands he uses to play guitar, mandolin and even drums. With his unmistakable charm, booming voice and magnetic stage presence, the 24-year-old Mumford can’t escape comparisons to U2’s Bono, no matter how hard he tries. Bono was 23 in 1983 when the band played through the rain and fog at the natural amphitheater west of Denver, and it forever established the Irish rock band as a must-see act. Mumford & Sons have already built a foundation in that regard, and this dramatic convergence of events — albeit with fog machines replacing the real thing — will undoubtedly enhance their reputation. 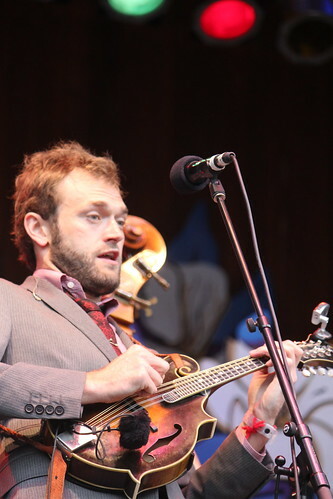 About premier player Chris Thile (left) of Punch Brothers, who preceded Mumford & Sons on the main stage, he said, “I’ve actually been teaching Chris the mandolin this year. And he’s really coming around well,” making sure everyone knew he was kidding. With that, Mumford tore through “The Cave” another slow-building number that takes listeners on an emotional journey ending with a fist-pumping chorus. By then, there wasn’t a dry eye — or any other body part, for that matter — to be seen for miles. 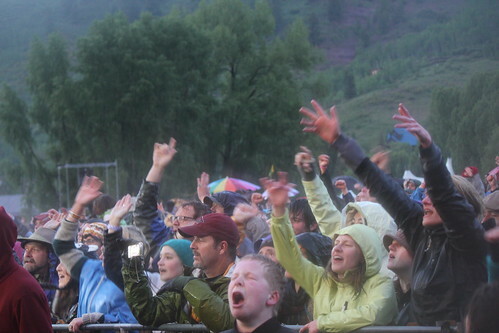 See the slideshow from Day 4 of Telluride.